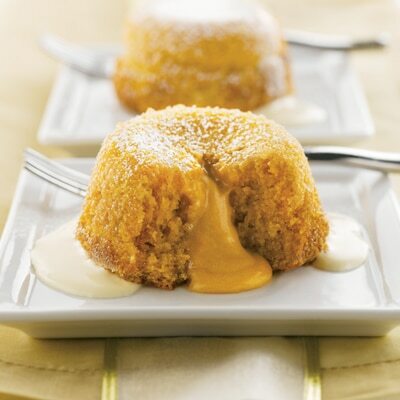 Filled with rich, creamy butterscotch and a flavorful blend of spices, these flavorful little molten cakes will make a stunning impression on family and friends alike. PREHEAT oven to 425º F. Generously butter six 6-ounce custard cups with 1 tablespoon butter. Sprinkle granulated sugar onto bottom and around sides of each cup. Dump out any excess sugar. COMBINE flour, ginger and cloves in small bowl. MICROWAVE morsels and remaining 7 tablespoons butter in medium, uncovered, microwave-safe bowl on MEDIUM-HIGH (70%) power for 1 minute; STIR. Morsels may retain some of their original shape. If necessary, microwave at additional 10- to 15-second intervals, stirring just until morsels are melted. BEAT eggs, egg yolks, brown sugar and vanilla extract in large mixer bowl for about 4 minutes or until thick. Stir in one-third of butterscotch mixture into egg mixture. Stir in remaining butterscotch mixture and flour mixture until well blended. Divide batter evenly among prepared cups. Place cups on rimmed baking sheet. BAKE for 15 to 17 minutes or until sides are set and 1-inch centers move slightly when shaken. Cake tops will be brown. Cool for 3 minutes. TO SERVE, run a thin knife around top edge of cakes to loosen slightly; carefully invert onto serving plates. Lift cups off of cakes. Sprinkle with powdered sugar. Serve immediately with melted ice cream.